Off we go again, thank goodness the sun was out and the bare legs appeared to be staying for the week. There where little pasty pins everywhere, I’m not sure why anyone thinks this is fashion. However Daks showed that they where the true essence of British fashion. Opening day two of ‘London Fashion Week’ in what would normally be the sleeping hours of an average Londoner’s Saturday morning. 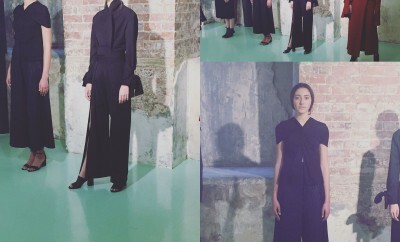 Sheila McKain-Waid produced simple elegant pieces for the Daks AW13 range which, lived up to the perfection that we have come to accustomed to with this classic British label. The trousers suit is very much part of London fashion week but Daks just showed how you can added a little bit of class to a trusty favorite. Themes were already starting to develop and oxblood red seems to be the colour to keep in mind for AW13. Classic pleated skirts, beautiful formed cropped tailored jackets completed the Daks show making this range something that the true British women dreams of. Sister Sibling stumbled and fell with their show of furious wools and shapeless knits; the colors were charming in a very wooly way. By 12 O’clock the colors where pumping through the veins of LFW and Jasper Conran finally added the perfect blend of colour and style, while knocking on the door of the swinging 60’s. The quirky bell hats could have stayed in the 60’s but they set the scene for the show. A massive contrast to a lot of what we had seen so far at LFW. Instead of tailoring, it flounced fabulousness, however there was still room for a classic, and the LBD wasn’t forgotten, it was a triumphant way to finish the show.